Tami at Running With Tweezers turned me on to this easy and unusual alternative to guacamole made with edamame, the boiled soybeans you often see served in their pods with a sprinkling of salt at Japanese restaurants. Happily, edamame are so mainstream these days that you can get them frozen, shelled or unshelled, in most grocery stores. Costco even sells them in boxes of individual bowls you can nuke for a snack. I decided to do a test batch today to see if I liked it enough to take to a Super Bowl party on Sunday. Conveniently, I had some of those Costco bowls, and one produced just over the 3/4 cup of shelled beans the recipe calls for. (Shelling took about three minutes after I nuked 'em). I had all the other ingredients on hand, too: lemon juice (from lemons I'd juiced earlier in the year and frozen in ice cube trays), garlic, olive oil, salt and sriracha sauce. Here's the result, and I have to say, it's really good. I had to up the lemon juice a little, and I think it needs more sriracha. It could also be jazzed up with diced tomatoes, maybe some minced shallots, a sprinkling of cilantro ... you could put a spoonful of sour cream in if you wanted it creamier. I took it to work and the handful of cow-orkers who got to try it (there wasn't enough for everyone) all agreed it was a success. I suggest tripling or quadrupling the recipe. At the Stock Show you can get your picture taken on a Clydesdale, a horse so big it should come with a Max. Cap. sign and a fire escape. Speaking of chickens ... this fellow was very mellow. So mellow that he was having a nice little nap amidst all the hubbub. I had to ask if he was blind, because he didn't open his eyes even when I was petting him. "No, he's just used to it. He can sleep through anything." Then snatched it back and let out an ear-piercing SQUEEEEEEEEEEE! 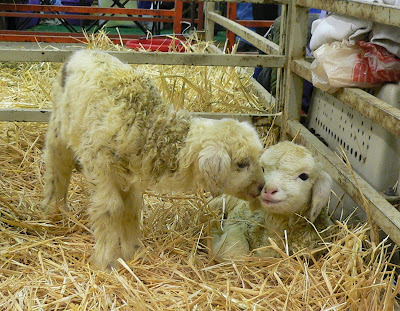 He gets brushed every day by his yarn-spinning owner. If you think chickens don't have a lot of personality, you should hang out with this bunch for a while. I think they should make them in superhero styles, don't you? Followed shortly by this 1960 Cadillac. Check out those fins! Ninety-nine percent of the cars I see are booooring. But that 1 percent is out there, and I've got my eyes open! 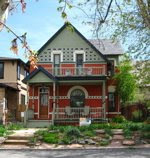 Sophie loves to visit Bell Studio & Gallery, because Susan often has dog treats there for her own dogs and readily shares. Yesterday she gave me a couple Natural Balance dog food rolls, which are packaged like little sausages. It was very hard to make her sit and stay for the first photo. Every time I backed up to shoot, she scooted forward. "Must. Get. To. Crack! Must. Have. NOW!" Ordinarily a very polite treat-taker, never ever mistaking fingers for food, she didn't give damn what was in the way. "I'll eat your fingers, too! Don't think I won't!" 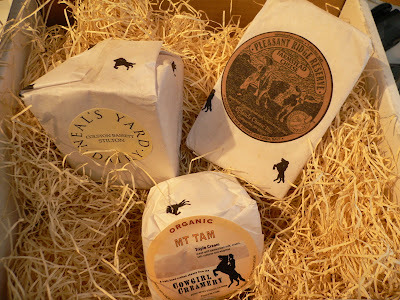 For my birthday I received a lovely gift of cheese from some lovely people, from one of my favorite dairies, Cowgirl Creamery. It included probably my favorite CC cheese, Mount Tam triple cream brie, some Pleasant Ridge Reserve from Wisconsin (wonderful stuff), and a big wedge of Neal's Yard Colton Bassett Stilton. The first two went quickly, and I've been stretching out the Stilton a wee nibble at a time. Oh my, how I love cheese. I wanted to do something special with the Stilton I had left and not just eat it all straight from the package, as I was close to doing, so I turned, as usual, to the handy Internets and found Epicurious' recipe for cream of cauliflower and Stilton soup, originally in Bon Appétit, February 1996. Lots of rave reviews, and some useful comments. 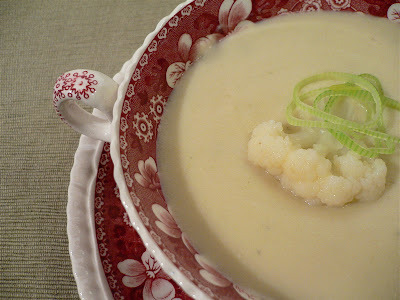 You chop up the cauliflower, onions, leek and celery. Blanch and chill a few of the prettiest florets of the cauliflower to use as garnish. I blanched a little of the leek, too, for color. In hindsight, I think I could have picked out a few florets from the saute mix for garnish just as easily, and snipped some chives for color, saving a pot and stove energy. Saute the chopped vegetables in butter until the onion is soft, stir in 1/4 cup flour and cook 2 minutes more, then add the chicken stock (or vegetable stock as the recipe calls for) and milk and let simmer for 20 minutes. Puree in a blender or with a stick blender (much easier), return to the pot and add the Stilton slowly, stirring until it melts. Also, per the Epicurious comments, I add a dash of Worcestershire sauce and a healthy splash of sherry at the end. Oh. My. God. I can't tell you how good this soup is. The picture does it no justice (such is the nature of beige cream soups). It is creamy and so very smooooooth (yes, the sieve does make a difference), with a light, nutty tang from the Stilton and a mellow finish from the sherry. You really must make this soup. Sieve it if you can, but you don't have to. Use Stilton if you can, but any robust bleu should work, too. Don't like cauliflower? Trust me, you'll like this. Well, Thursday, but they're a day old in this photo. 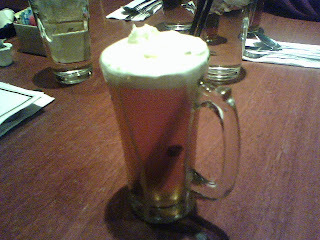 Hot cider with Tuaca, cinnamon stick and whipped cream. Too cold out for a mojito. This sweetheart of a mule just wanted his nose stroked, but from this angle he looks like some old Italian guy named Sal with five-o'clock shadow and sporting a wife-beater. Click to see it larger. More later. 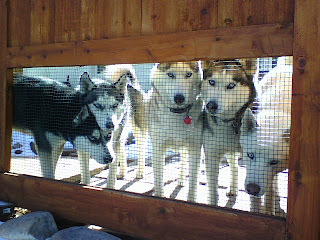 My backyard is full of bones. And every single one has a spray of little footprints around it. Not from the dog, who has removed every molecule of marrow-y goodness she can, but from flickers. Those long pointy beaks are good bone-cleaners. I wonder why, as birds who get most of their sustenance from bugs, they don't fly south. How many bugs can there be when it's 10 degrees out? It's interesting that they will seek out the bones in the yard, but I never see them working on road kill. Why is a cow bone OK but dead squirrel not? This may not look very appetizing, but trust me, it's quite tasty. I started it Sunday morning in the crockpot and left it to cook until Monday morning. The ingredients: one leftover hambone, split (with a hammer), a couple big chunks of ham, a pound of small red beans soaked overnight and rinsed, a large minced onion and about 5 cloves of minced garlic, and water to cover. I tasted it Sunday night and it was a little bland, so I added a tablespoon of Worcestershire sauce, a couple of bay leaves and a few good shakes of Tony Chachere's More Spice seasoning. Monday morning, I cut up some more leftover ham in bite-sized chunks and tossed it in for about an hour. This was key, I think, because the ham already in there had leached out all its meaty goodness into the broth. I fished those bigger chunks out and threw them away. So I had a nice meaty broth plus pieces of ham that still tasted hammy. I also mashed some of the beans in the pot against the sides to make the broth thicker. If you want, you can throw in some sliced chorizo or andouille sausage instead of or in addition to the fresh ham, or some spicy sauteed shrimp just before serving. If you like spicy, add tobasco or Crystal hot sauce. I just had time to toss it over fresh rice in a Tupperware container to take it to work. A serviceable  if not elegant  meal! I don't feel up to doing all the fancy formating right now (long day), so you're getting big, centered pictures of my Adventures in Challah. I think you can deal with that. As I noted yesterday in the caramel pecan rolls post, the recipe came from "Artisan Bread in Five Minutes a Day," as adapted by Jaden at Steamy Kitchen. Happily, Jaden provided another recipe so I could use up the rest of the dough with something different: No-Knead Nutella and Roasted Hazelnut Challah. The dough, as before, is shaped into a loaf and left to sit for a bit to warm up, then divided in three and rolled out into snakes, with an indent poked down the length of each one to receive the filling. Then the sides are pinched together and the snakes braided to make a loaf. Brush with egg wash, scatter toasted crushed almonds on top (I didn't have hazelnuts, either) and bake. Pretty! I let it cook a little too long, since I was thinking it should be a little more golden on the top, but it still tasted quite fine. I don't have pictures of it sliced because it went straight to work and was devoured quickly. When I make this again, I will use much more filling. Much much more. And get sliced almonds for the top. If you like to read, check out the newly reborn Readerville Journal. As a print magazine it was lovely but ill-fated. Now it lives again online, with interesting articles on a variety of book-related topics, updated daily, and book recommendations. It's nicely designed, too; very simple and visually pleasing. 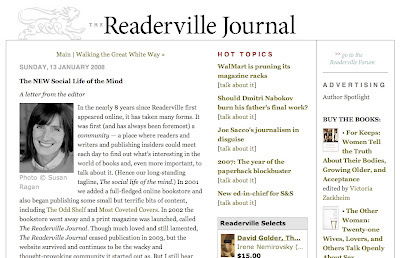 If you like books, you'll like the Readerville Journal. First, a product endorsement: I ran to the store for some flour the other day and discovered it's now available in resealable plastic bags. How long has that been going on? I am psyched because I usually have to transfer my flour to a plastic bag anyway for storage and the bag is designed so you can scoop and level with it standing upright on the counter without making a mess. Thank you, Gold Medal Flour people! And now, the buns. Or the rolls, if you prefer. Or the dangerously delicious delights of diet doom. It all starts innocently enough, with the sweet master dough from "Artisan Bread in Five Minutes a Day." Yes, that book, which has been blogged about hither and yon lately. Much like no-knead bread was a year ago. And fittingly, since it builds on the same principle of letting time do the work for you. Kris has been making bread and rolls, which look lovely, and she has some videos of the process you can check out. But Jaden kicked my interest up a notch – OK, twenty notches – with her photos of the pecan caramel cinnamon rolls. Plus a contest to win a copy of the book. .... Oh, sorry, my mind wandered there for a minute. Focus on the dough above and loaf at left. The dough includes seven cups of flour, a lot of yeast, honey as a sweetener, and some other stuff. That's a lot of dough! The idea is that you make a lot and let it sit in the fridge for days, pulling off hunks a nd baking it as needed. Such as the shaped loaf you see here. To make the rolls, you roll out the dough, spread the filling, roll up the dough and slice. If you lack a rolling pin, a wine bottle filled with cold water works nicely. I was supposed to start with dough "about the size of a small cantaloupe." Apparently my melons are bigger than Jaden's. I got all the official filling spread in the middle, and I stretched it on the edges by mashing up a little butter and sugar separately and cooking those rolls in another dish. But wait! I forgot to show you the topping. Which starts out as the bottoming. It's hard not to be obsessive about design when working with pecan halves. You can't just scatter them. Bake for about 40 minutes, invert onto a platter (watch out for the melted butter!) And ta-da! Here they are at my office, on a desk known as "The Trough" (also known as the "Not a Trough" since we're not supposed to have food there). Yes, they are as yummy as they look. 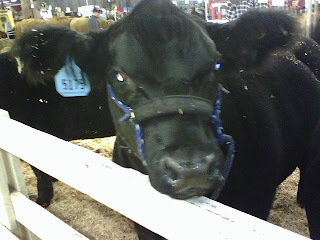 The cow-orkers enjoyed them very much. Will I make them again? Maybe, but while the dough was easy to whip up, the whole process of making the topping and the filling in separate batches, and spreading both out, and rolling the dough and pounding the pecans with a hammer for the filling and toasting them and the halves in separate batches, uphill, barefoot, in the snow ... well, it was a lot of work for essentially eight rolls. (OK, the little extra ones were tasty, too.) But I'm lazy like that. My whining is not a slam of the book at all, and I plan to find a copy ASAP so I can deal with the rest of the dough that's sitting in my fridge! 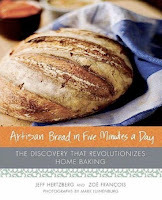 "Artisan Bread in Five Minutes a Day" by Jeff Hertzberg and Zoë François is back-ordered at Amazon, but you should check with your local independent bookseller or cookshop to see if they have it, or order it through them. New word: "Toile de Jouy"
Pickled carrots and green beans: Tangy!